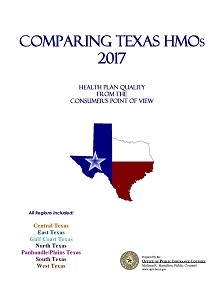 Comparing Texas HMOs is an annual report of HMO consumer satisfaction. OPIC uses the consumer satisfaction measure for the Healthcare Effectiveness Data and Information Set (HEDIS) to create this report. Texas law requires HMOs to submit HEDIS measures—including consumer satisfaction data—on an annual basis. Report is available in PDF format only.